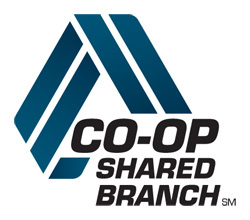 As our member, you can visit any of the more than 5,600 branches and a total of 7,300 locations where you see the CO-OP Shared Branch logo, and conduct transactions just like you were at your home branch. Learn more about how to use Shared Branching by watching this video. Find a branch location right now at www.co-opsharedbranch.org or call 1-888-748-3266. See how many Shared Branching Locations are in each state. iPhone or Android Text a Zip Code to 91989 to find nearby ATM and Shared Branch Locations. SBX = Shared Branch express Call 1-888-SITE-CO-OP (888-748-3266) to find a location by telephone. Available to CO-OP Shared Branch members. Call 888-837-6500 for live personal assistance.